The new Jeep Grand Cherokee has been unveiled at the New York motor show. The car, which will go on sale in 2010 in the U.S and 2011 in the UK, has a new exterior look, a revamped interior, and an all-new V6 engine that is up to 11% more fuel efficient. Jeep has revealed two petrol engine options for the U.S but diesel versions will be available in Europe. The U.S receives an all-new 276bhp 3.6 litre Pentastar V6 with 260lb ft of torque. Linked to a 5 speed automatic gearbox, it is up to 11% more fuel efficient than the Grand Cherokee's previous 3.0 litre V6 engine. The 355bhp 5.7 litre Hemi V8 with 390lb ft of torque is carried over from the previous model. No fuel efficiency figures have been released but don't expect anymore than 25mpg combined. Europe will get the current 3.0 CRD V6, which is likely to be tweaked to make it more fuel efficient. Jeep has completely redesigned the interior to meet European standards. The interior has been designed by Chryslers Advanced Interior Design Studio. The new Grand Cherokee's wheelbase is 13.25cm longer than the model it replaces but just 4.5cm longer overall. As a result, interior space is increased with particular emphasis on improving rear passenger space. The rear doors are also larger to improve access. Boot space is also up more than 15%. The track is also 7.5cm wider to improve handling. The car will be sold with 17 inch wheels as standard, with options of 18 inch and 20 inch wheels. It is available with full-time four-wheel drive, a system which transfers power between axles to avoid wheelspin and a system that uses an electronic limited-slip differential to provide maximum traction. Built on the same underpinnings as the Mercedes M-Class, it has a new air suspension system called Quadra-Lift. This has five height settings, two of which the driver can select, and three of which engage automatically. Two automatic settings cover off-road use, while the third lowers the vehicle slightly at speed to improve fuel economy. The two driver selectable settings cover normal on-road use and a park mode, which lowers the car by just under 4cm. On the two higher-spec models, Quadra-Lift works in conjunction with the Selec-Terrain system to allow the driver to choose between on-road and off-road settings. Selec-Terrain has 12 different settings which co-ordinate the powertrain, braking and suspension settings, selecting the best one automatically after the driver has selected from five driving conditions: sand/mud, sport, auto, snow and rock. Combined with new, independent front and rear suspension, Jeep says that the Quadra-Lift and Selec-Train systems deliver 'premium on-road handling and comfort.' The revised suspension also means the spare tyre is stored in the car, rather than under it. The car also has greater approach, departure and breakover angles with the front air dam removed. It has a 35.9 degree approach angle (compared with 32.3 on the current model), 29.2 degree departure angle (against 27.5) and 25.1 degree breakover angle (versus 20.4). Among the key interior, U.S options are an Onstar-like "uconnect guardian" telematics system, a CommandView panoramic sunroof and power operated rear tailgate. The high-spec Overland model comes equipped with a heated steering wheel, heated and ventilated front seats, heated rear seats, four-way power lumbar controls, rain-sensing wipers, Keyless Go, a rear-view camera and a power tilt/telescoping steering column with memory and xenon headlamps. UK models should be available as three trim levels: Standard, Limited and Overland when it goes on sale in early 2011. Entry-level Grand Cherokee's will have body-coloured electrically adjustable, heated door mirrors, tilt/telescopic steering wheel, cruise control, leather steering wheel, 17 inch alloy wheels, front fog lamps, 4 way adjustable drivers seat, ESP, hill start assist and x4 electric windows as standard. Limited models will add auto-dimming rear-view mirror, electric folding door mirrors, 18 inch alloy wheels, electrically adjustable heated leather seats, 6 airbags, parking sensors, auto headlamps and wipers. Options will include 20 inch alloys, CommandView panormic glass roof and uconnect sat-nav with rear-view camera with 9 speaker sound system. Overland models will have electrically adjustable steering column with memory function for front seats and door mirrors, xenon headlamps, ventilated front seats with heated rear seats, auto-dimming door mirrors, wood/leather steering wheel, adaptive cruise control and power tailgate. Nearly 18 years ago, Jeep invented the premium SUV segment with the introduction of the Jeep Grand Cherokee. More than 4 million sales later, Jeep improves the formula and hits the sweet spot of real-world capability and on-road refinement with the all-new 2011 Jeep Grand Cherokee. The all-new Jeep Grand Cherokee delivers premium on-road performance while maintaining the Jeep brand’s legendary four-wheel-drive, torque-on-demand two-speed transfer case and towing capability. It also offers improved fuel economy (up to 11 percent) and a world-class interior cabin. “We listened carefully to our customers and the market,” said Scott Kunselman, Vice President – Jeep/Truck Product Team, Chrysler LLC. “Our all-new Jeep Grand Cherokee hits the sweet spot of premium on-road performance and legendary class-leading Jeep capability.” The all-new Quadra-Lift air suspension system delivers legendary Jeep off-road capability along with the new Selec-Terrain system that allows the driver to choose the drive system that best matches on- or off-road driving conditions. New front and rear independent suspension systems deliver premium on-road handling and comfort. The all-new 2011 Jeep Grand Cherokee is built on a proven rear-wheel-drive unibody platform sharing the same underpinnings as the Mercedes-Benz ML. “Jeep invented the SUV segment and our all-new Grand Cherokee is the next step in the evolution of the SUV,” said Mike Accavitti, Director – Jeep, Chrysler and Dodge Brands. “Jeep innovations including Quadra-Lift air suspension and Selec-Terrain traction control separate us from the crowd.” Legendary Capability The all-new Jeep Grand Cherokee offers the new Quadra-Lift air suspension system. Quadra-Lift adds up to 4.5 inches of lift span that is supported by four-corner air springs that provide a cushioned, premium ride. Quadra-Lift operates automatically, or may be controlled manually via console controls. In addition to the Quadra-Lift air suspension, the all-new Selec-Terrain™ traction control system lets customers choose the off-road setting for the optimum experience on all terrains. This feature electronically coordinates up to 12 different powertrain, braking and suspension systems, including throttle control, transmission shift, transfer case, Traction Control and Electronic Stability Control (ESC). Selec-Terrain, coupled with the all-new Quadra-Lift air suspension, offers drivers an adjustable suspension span that delivers legendary Trail Rated® performance. With the front air dam removed, and the available Quadra-Lift air suspension, the all-new Jeep Grand Cherokee features a 35.9-degree approach angle, (compared to 32.3 on current model), a 29.2-degree departure angle (compared to 27.5 on current model) and 25.1-degree breakover angle (compared to 20.4 on current model). The all-new independent front and rear suspension features isolated front and rear suspension cradles. Variable-rate rear springs deliver improved on-road handling and comfort that complements the vehicle’s off-road capability. The new rear suspension allows the spare tire to be stored inside the vehicle as opposed to underneath. 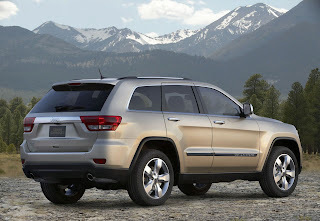 The 2011 Jeep Grand Cherokee offers three 4x4 systems (Quadra-Trac I®, Quadra-Trac II® and Quadra-Drive® II). Quadra Trac I delivers full-time four-wheel drive without any switches or levers to pull. The system provides smooth operation over a variety of road conditions. This light-weight single-speed case is both proven and highly efficient for enhanced fuel economy. Quadra Trac II’s two-speed transfer case uses input from a variety of sensors in order to determine tire slip at the earliest possible moment and take corrective action. The system uses Throttle Anticipate to sense quick movement in the throttle from a stop and maximizes traction before slippage occurs. When tire slippage is detected, as much as 100 percent of available torque is instantly routed to the axle with the most traction. Quadra Drive II, with a rear Electronic Limited-Slip Differential (ELSD), delivers industry-leading tractive capability. The system instantly detects tire slip and smoothly distributes engine torque to tires with traction. In some cases, the vehicle will anticipate low traction and adjust in order to proactively limit or eliminate slip. Selec-Terrain is standard with Quadra Trac II and Quadra Drive II. Jeep Trail Rated® All 2011 Jeep Grand Cherokees equipped with either the off-road or the Quadra-Lift group are Trail Rated®. The Jeep Trail Rated badge on the 2011 Jeep Grand Cherokee indicates that the vehicle has been designed to perform in a variety of challenging off-road conditions identified by five key consumer-oriented performance categories: traction, ground clearance, maneuverability, articulation and water fording. Jeep Trail Rated is a unique methodology used by Jeep Engineering to measure and predict off-road performance for all Jeep vehicles. Through a combination of natural and controlled field tests, Jeep Trail Rated provides a consistent measurement of off-road performance for all Jeep vehicles. Only Jeep vehicles are Trail Rated. Powertrains: The all-new 2011 Jeep Grand Cherokee is available with two leading engine options for North American markets. The 2011 Jeep Grand Cherokee’s standard engine is an all-new flexible fuel 3.6-liter Pentastar V-6 engine. The 3.6-liter V-6 engine is an all-new design featuring double overhead camshafts (DOHC) and a high-pressure die-cast aluminum cylinder block in a 60-degree configuration. It features Variable-Valve Timing (VVT) and delivers 280 horsepower (209 kW) and 260 lb.-ft. of torque (353 N•m) @ 4,800 rpm. This all-new Pentastar V-6 engine improves fuel economy up to 11 percent compared to the previous Grand Cherokee equipped with a V-6. It is coupled with the proven W5A580, a five-speed automatic transmission that delivers smooth shifts and optimum fuel economy. The five-speed W5A580 transmission includes adaptive electronic control or Electronic Range Select (ERS) driver-interactive manual control and an electronically modulated torque converter clutch. The all-new 2011 Jeep Grand Cherokee’s larger fuel tank, with a 24.6 gallon capacity, combined with the Pentastar V-6 engine’s improved fuel economy, delivers a range of approximately 500 miles on one tank of gas. The available legendary 5.7-liter HEMI® V-8 engine delivers 360 horsepower (268 kW) and 390 lb.-ft. of torque (520 Nm) @ 4,250 rpm. The HEMI also features VVT, which delivers performance and towing capability, as well as fuel efficiency with the fuel-saving Multi-displacement System (MDS). The 5.7-liter HEMI V-8 engine is mated to the 545RFE multi-speed automatic transmission. The all-new Jeep Grand Cherokee offers unsurpassed trailer tow capability of up to 7,400 lbs. on 4x2 models when equipped with the HEMI V-8 engine. For international markets, the all-new 2011 Jeep Grand Cherokee will be available in left- and right-hand drive with either diesel or petrol powertrains. The all-new interior is elevated to that of its European competition and features rich materials and elegant appointments, as well as more room for both passengers and cargo. “Following in the footsteps of our all-new 2009 Dodge Ram, our all-new Jeep Grand Cherokee is another proud graduate of our Advanced Interior Design Studio,” said Ralph Gilles, Vice President – Design. “We achieved a world-class interior by using fine materials and maintaining a laser-attention to details.” An available all-new CommandView® dual-pane sun roof provides twice as much glass surface than a standard sun roof and extends from the windshield to the rear of the vehicle. The front panel can be opened rearward, providing additional light and fresh air to first-row passengers. The rear panel, which is fixed, allows light and open viewing for second-row passengers and comes standard with a power sun shade. The vehicle’s 114.8-inch wheelbase is 5.3 inches longer than the model it replaces and contributes to an overall vehicle length that is 1.8 inches longer than the prior model. The longer wheelbase creates more interior room and gives passengers an additional 4 inches of rear-seat knee and leg room. The vehicle also is 3 inches wider for improved handling and packaging. Larger front door openings (1.9 inches wider; 2 inches higher) and rear doors open 78 degrees compared to current models (67 degrees) for better access to the interior. Inside, premium seating includes room for five passengers. An available fold-flat front-passenger seat provides improved cargo storage room (Laredo models). For added passenger comfort, rear seats recline 12 degrees. There also is a 12-degree forward angle to allow 24 degrees of variation. Cargo volume behind the second-row provides an additional 6.8 cubic feet of room (36.3 cubic feet total) compared to the previous model. The well-appointed rear cargo area includes a storage unit with a rechargeable flashlight and new and improved grocery hooks on both sides. The spare tire compartment includes removable dual storage bins for secure storage of muddy gear or other items. An all-new power rear liftgate is available for effortless remote up/down convenience. Every surface of the all-new Jeep Grand Cherokee is new and treated for aerodynamics. This improves fuel efficiency and puts more fluidity into the design while delivering a 7- percent improvement in drag compared with the current model. 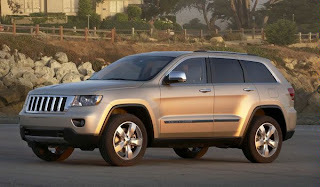 The all-new 2011 Grand Cherokee Cd is approximately 0.37 compared with the 2009 Cd of 0.404. “Our all-new 2011 Jeep Grand Cherokee is much more refined, focused and sportier than the model it replaces,” said Gilles. “It has classic Jeep Grand Cherokee styling with sculpted athletic exterior refinements for 2011.” The front includes Jeep’s classic seven-slot grille, round headlamps and trapezoidal wheel arches. The removable lower front fascia delivers improved fuel economy, on-road performance and off-road capability. The lower front fascia features a large chromed appliqué (Limited and Overland models) that showcases available tow hooks. From the side, Jeep Grand Cherokee features an athletic, muscular profile. Black appliqués on B-pillars give the day-light opening (DLO) an aerodynamic, modern appearance and a sleek profile. Available chromed mirrors and door handles add to the profile and complement the full-chromed DLO surround on all models. Seventeen-inch wheels are standard and deliver off-road capability, with optional 18-inch and all-new to Jeep, 20-inch wheels for 2011. Taillamps wrap from the rear quarter panel to the back of the vehicle and create a solid form which achieves more of an upscale appearance. The treatment complements the front-end design and resonates with the rest of the exterior. Jeep Grand Cherokee models equipped with a HEMI V-8 engine have 3.5-inch dual chromed exhaust tips, and those with the Pentastar V-6 engine have a 3-inch single exhaust. Premium Performance Continuing to build on the Jeep brand’s legendary off-road capability, the all-new 2011 Grand Cherokee adds premium on-road performance to complete the package. The all-new 2011 Jeep Grand Cherokee’s premium SUV on-road manners and legendary Jeep ruggedness is achieved with more than 5,400 welds in the body alone. Torsional stiffness is 146 percent more than the current Grand Cherokee and stiffer than the BMW X5 and Toyota Highlander for improved durability and reduced noise, vibration and harshness (NVH). With more than 3,700 mm of arc welding and 100 m of structural adhesive to augment welding, this marks a 53-percent increase in spot welds, a 42-percent increase in arc welds and a 38-percent increase in structural adhesive. The 2011 Jeep Grand Cherokee also features SIRIUS Travel Link. Giving drivers up-to-the minute information about, gas prices, weather conditions, sports scores and movie listings. In addition, the all-new 2011 Grand Cherokee features SIRIUS Traffic, which monitors traffic in 78 markets across the U.S. and continuously displays those conditions through the vehicle’s nav system. Together SIRIUS Traffic and Travel Link connect Jeep Grand Cherokee drivers and passengers to the information they need while on- or off-road. Manufacturing The all-new 2011 Jeep Grand Cherokee will be built at the 2.7-million-square-foot Jefferson North Assembly Plant (JNAP) in Detroit, which has been the site of Grand Cherokee production since its introduction in 1992. In preparation for production of the all-new Grand Cherokee, Jefferson North Assembly is undergoing a 285,000-square-foot expansion to replace the existing body shop, which is part of Chrysler’s investment of approximately $1.8 billion in new vehicle programs. In addition, changes throughout paint and assembly operations will give the facility an all-new level of manufacturing flexibility for multiple product capability. JNAP was built in 1991 and was expanded in 1999.